Once a year, in the middle of the dense heat and humidity of Jeju’s rainy season, Geomun Oreum holds the ‘Jeju World Natural Heritage International Trekking Fair’. During the festival, visitors can visit the oreum and the surrounding area freely, whereas usually people have to reserve a spot two days in advance. As well as this, the week long festival is the one time a year that people can hike the ‘Yongam Trail’. 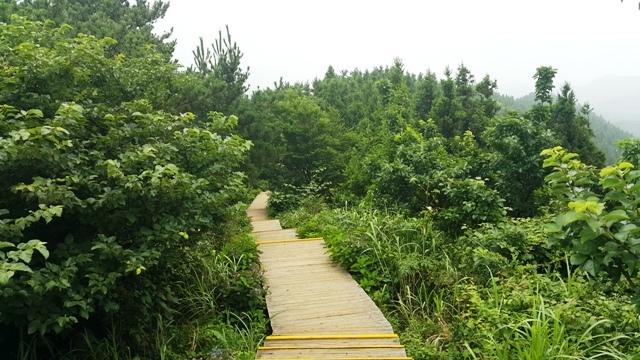 This is a wild, winding walk through one of Jeju’s Gotjawal forests. In total, there are around 20kms of trails that are open to the public during the festival, although most people will only choose to do a selection of the course. One of the most popular courses is to the top of Geomun Oreum itself. Reaching a height of 456 meters, the steep but well-paved trail offers visitors a pristine view of the unspoiled scenery surrounding the Oreum. Due to some unique volcanic activity during the formation of the Oreum, it has a crater-like shape which makes for some spectacular views over the tree covered valley. The fact that Geomun Oreum is in a fairly remote location also means that the view is uninterrupted for miles all around. As well as the natural beauty of the area, there are a number of other points of interest surrounding the Oreum. The aforementioned volcanic structure is unique and the area has a vast network of lava tubes and other volcanic residues. Along with the lava tubes, Geomun Oreum has a second network of hidden tunnels beneath its surface. During their occupation of Jeju, Japan built around ten military tunnels on the oreum, the longest of which is around 60 meters long. While walking, if you search hidden in the bushes, you can spot the entrances to a number of these tunnels. There are also disused Charcoal Kilns, military stations and a large variety of plants and trees found in the area. The main event of the festival, however, is the Yongam Trail which is a completely different beast when compared to the trail to the oreum's summit. As the Yongam Trail follows a path created by lava flows from the oreum, as soon as you enter the Gotjawal forest, the path almost disappears. You then spend the next section of the journey trekking through beautiful, almost untouched forest. This allows you to really get up close to some of the area’s unique plants and trees, all while staying sheltered from the mid-July heat. The final section of the trek sees visitors walk through some of Jeju’s many green tea fields, this is a stark change in surroundings but nonetheless an interesting way to finish the walk. The ‘World Natural Heritage International Trekking Fair’ at Geomun Oreum ran from July the 9th to the 18th. While the Yongam trail is only open during the festival, the Geomun Oreum trails are certainly worth a visit and are open all year round. However if you choose to visit Geomun Oreum, make sure to reserve your spot at least two days in advance through the Geomun Oreum website.